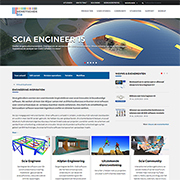 The new site got a much shorter domain name: www.scia.net and offers a clean, modern and minimalistic design, delivering an easy-to-navigate and content-rich site experience. It offers the thousands of daily visitors and customers a quicker access to the information they are looking for, such as product information, detailed features, local events, webinars, videos, etc. Customer experience being a central priority for us, case studies and reference projects are now better in the focus in the main menu. Our offer for students and professors also gained more visibility. Furthermore, to go with the times, this website adapts dynamically to the viewing device and will present an adapted layout on tablets or smartphones to greatly improve the mobile viewing experience. We hope you will enjoy our new website and we will highly welcome any feedback on how to make it even better.